Riverside, CA – GCVCC Staff was able to attend to two large regional gatherings last week. This is part of a broader outreach effort to expand the valley’s economic presence and bring back best practices to our members. 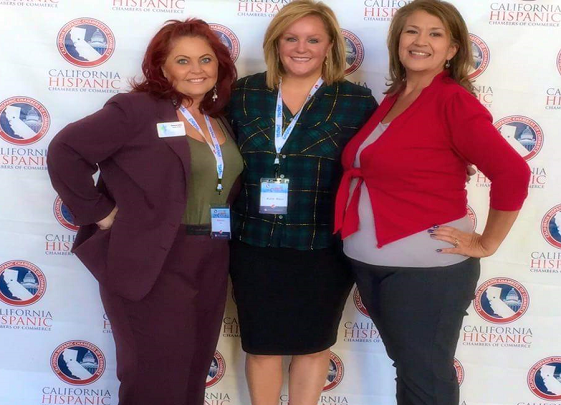 A contingent of GCVCC executives traveled to Riverside to participate in the 37th Annual State Convention of the California Hispanic Chamber of Commerce. Our staff was generously hosted by AT&T. This year’s convention theme, “Innovation Starts Here”, focused on new innovations sparking the creativity of entrepreneurs throughout California, technologies that are transforming industry and Hispanic millennials who are forging their own paths in business. Each year, the CHCC Annual Convention attracts over 3,000 entrepreneurs, small business advocates, corporate representatives, community leaders and government officials. The GCVCC was also represented at the regional gathering of the American Advertising Federation. The 3-day summit featured advertising professionals from across America gathering to discuss current marketing trends, best practices and emerging communication tools. The GCVCC was proud to present on a panel focusing on effective events and fundraising for non-profits and clubs. A special thanks to the Desert Advertising Federation Palm Springs for hosting our team.